A couple of weeks ago I was strolling through a mall on the other side of town to celebrate my husband’s birthday. The man and the child vanished into the children’s play area and I got a little time to peruse the supermarket next door which I had eyed on my way in. In the midst of the plastic wrapped veggies and fresh fruits there was a whole aisle of potted plants. Thyme, Oregano, Basil and Rosemary plants no less!, I almost squealed with joy! Next thing I can remember is my husband, potted plants in hand, grumbling all the way to the car. 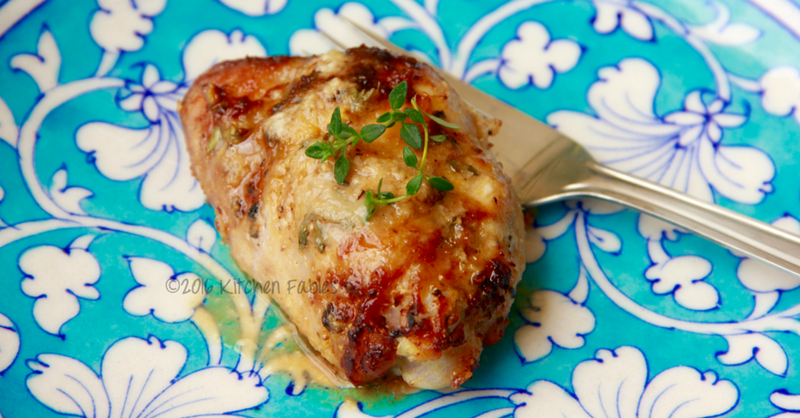 Ever since then, I have been itching to make this lemon and thyme chicken. Though there are dry herbs easily available in the market even in India, they are no match for the flavour of fresh herbs. My daughter has recently learnt in school about taking care of plants, so its great for her as well. Watering the plants is her responsibility (though she is still learning how to say the word! ” res-pons-table” is how far she has got). With the heavy rain and flooding in many areas, venturing out this weekend was out of the question. Wondering how to get the ingredients for the recipe, I discovered Licious. Thanks to the Licious I ordered the cuts of chicken that I wanted and it was delivered at my home. Food tastes better with friends (no don’t eat your friends!!) and so we had a small get together and this chicken was the starter with some nice red Wine as accompaniment. Since the chicken was marinated for a long time it had a nice flavor of thyme , orange liqueur and lemon. I have used orange liqueur for marinating the chicken but you can also use white wine, apple cider vinegar or apple juice. 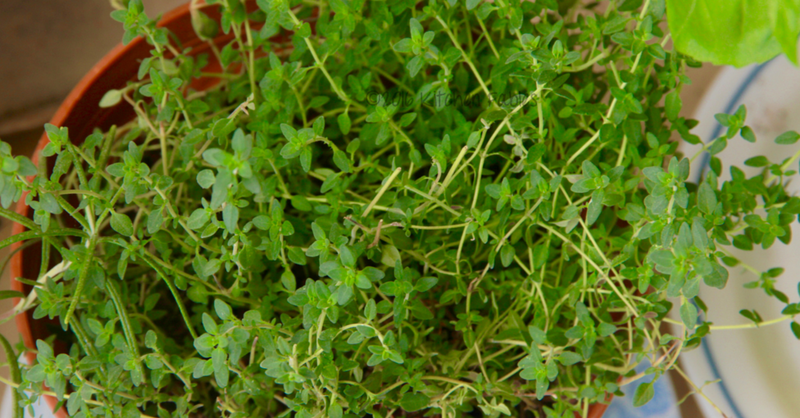 I have used fresh herbs but in case you do not get fresh herbs, you can use dry herbs, too. Also, if you do not have an air-fryer you can roast the thigh pieces in the oven for 20 minutes at 200 degrees or cook it on a girdle with a little oil. 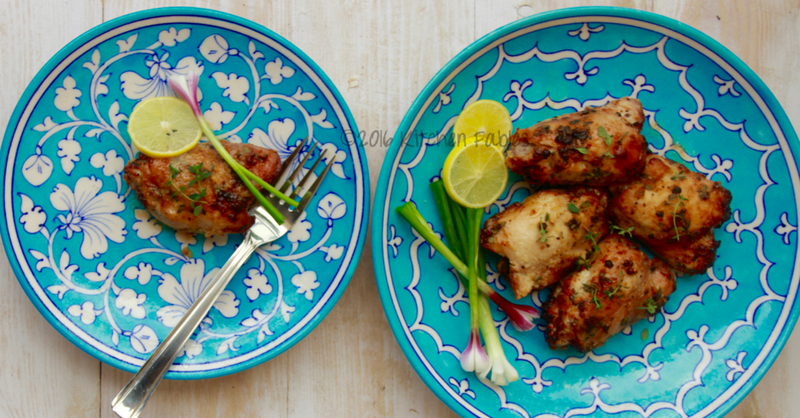 If you are watching your weight or are looking for chicken recipes with less oil, this is a good bet. I used an air fryer to Barbeque the chicken. On Barbeque mode in the air fryer cook the chicken for 20 minutes. In between remember to flip the chicken. Once the chicken is golden on both the sides insert a toothpick or a fork to check if the chicken is cooked. If you do not have an air fryer you can also cook the chicken on a griddle or in bake in the oven at 200 degrees. 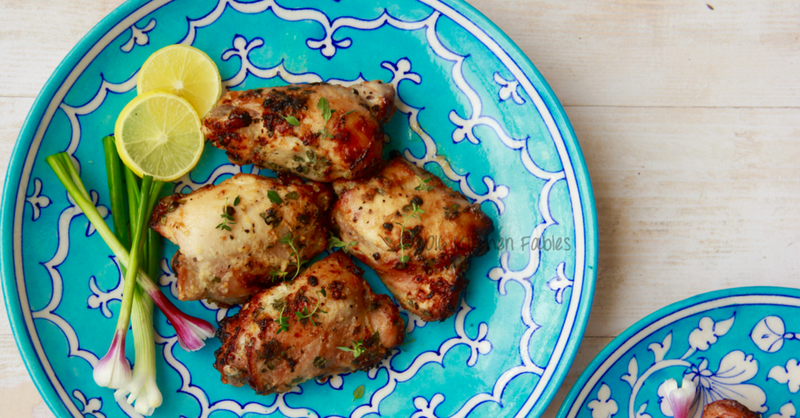 Serve hot with green salad and lemon wedges. You can also serve it in main course with steamed veggies and herbed rice or garlic bread.